Homemade chocolate frosting adds a special touch to these shortcut football shaped brownies, made from a boxed brownie mix. 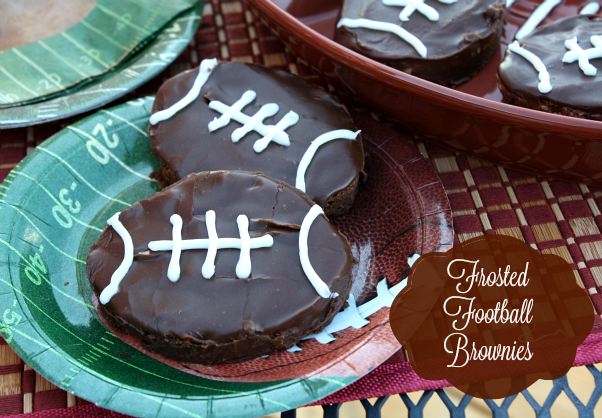 A couple months back, I made these Frosted Football Brownies for Walmart, but I'm just now getting around to posting them on the blog. I guess things kind of work themselves out, because these yummy brownies are perfect if you're having a tailgating party or if you're planning a Superbowl get-together next month. Whichever you plan your football fans will love these tasty brownies. This recipe is a shortcut version, because it utilizes a boxed brownie mix, but feel free to use your own favorite brownie recipe. You can also use store bought canned frosting, but I used my favorite homemade chocolate frosting that I highly recommend. 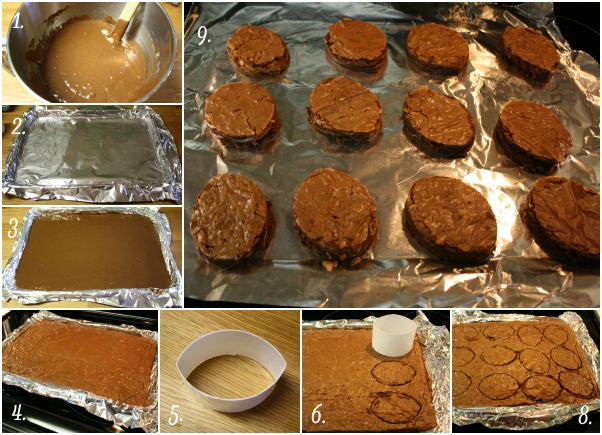 These brownies are super simple to make, the most difficult thing for me was finding a football shaped cookie cutter. If you don't have one on hand no problem you can make your own from an empty frosting container. Just cut the top and bottom off from the frosting can and keep the middle. Take the middle part and flatten it down with you hand on the counter and let go, when it pops up you will have the perfect football shape (see example below in the photo directions). Let's get started on these easy brownies. Large rimmed baking sheet (18 x 13 inch), aluminum foil, 2 - store bought (13 x 9 inch) brownie mixes + eggs, oil and water called for on the back of the box, butter, milk, water, unsweetened baking cocoa, powdered sugar, vanilla extract, football cookie cutter or DIY footballs cookie cutter, white decorator frosting (to make football laces). Start by pre-heating the oven to 350 degrees. Line a 17 x 12 x 1 ½ inch jelly roll pan with foil so that the foil extends about 2 inches over the sides of the pan. 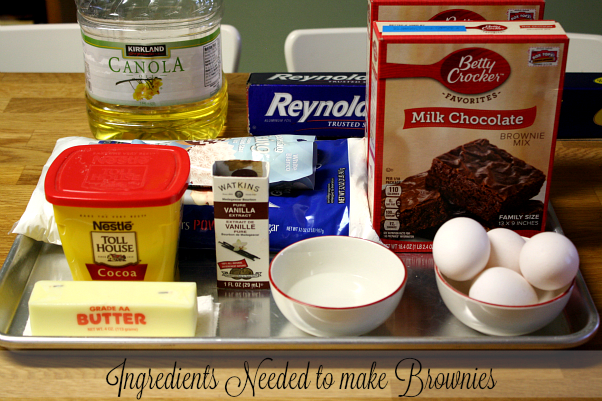 Prepare brownie mixes according to package directions, adding the oil, eggs, and water called for on box. Bake the brownies for 24-27 minutes or until done. Cool brownies completely in pan for about 1 hour. Using the foil to lift, remove the brownies out of the pan. 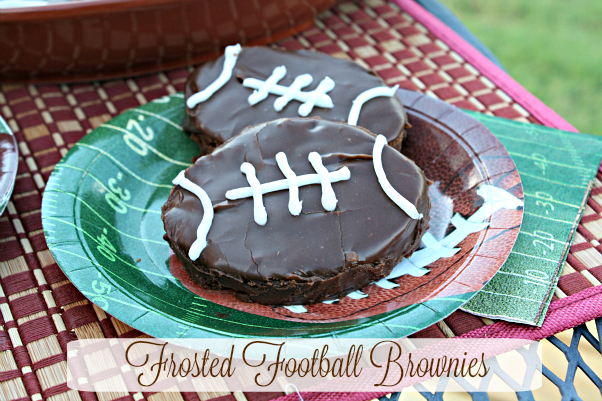 Using the football shaped cookie cutter, cut out the brownies into football shapes, and set aside. To make the frosting, in a medium size sauce pan, bring the butter, milk, water, and unsweetened cocoa to a boil. When the mixture comes to a boil, remove pan from heat, and add the vanilla extract and powdered sugar. Mix well using a wire whisk. Let the frosting cool a bit, so it can thicken up. If you're in a pinch for time here's a tip to quickly cool the frosting. In a large bowl at cold water (I add ice). Place the whole pot of frosting into the water. Using a wire whisk, quickly mix the frosting until it thickens. 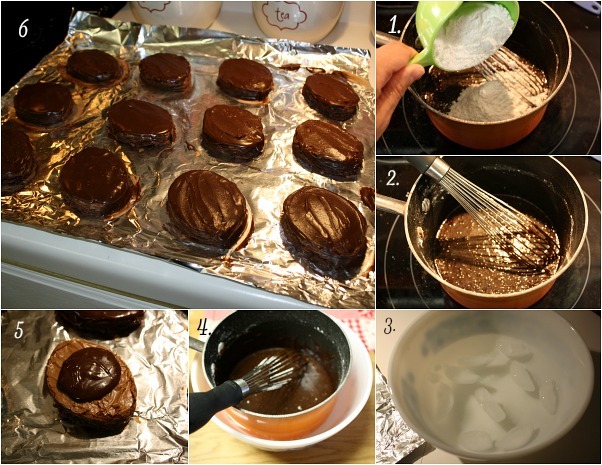 Remove pot from water and frost the brownies. Spoon 1 - tablespoon of warm frosting over each brownie and spread to the edges. Allow the brownies to cool completely before piping on decorator icing to resemble football laces. Preheat oven to 350 degrees. Line a 17 x 12 x 1 ½ inch jelly roll pan with foil so that the foil extends about 2 inches over the sides of the pan. Prepare brownie mixes according to package directions, adding the oil, eggs, and water called for on box. Bake the brownies for 24-27 minutes or until done. Cool brownies completely in pan for about 1 hour. Using the foil to lift, remove the brownies out of the pan. 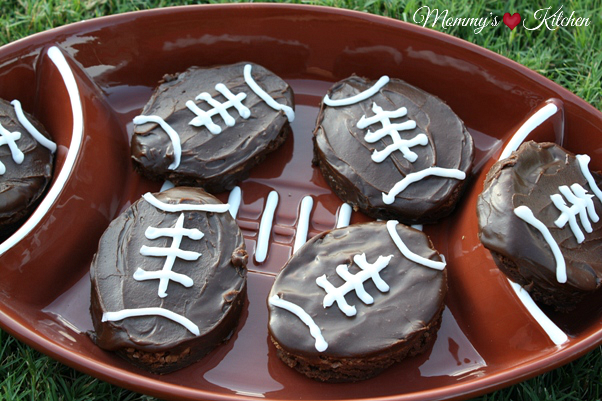 Using the football shaped cookie cutter, cut out the brownies into football shapes, and set aside. To make the frosting, in a medium size sauce pan, bring the butter, milk, water, and unsweetened cocoa to a boil. When the mixture comes to a boil, remove pan from heat, and add the vanilla extract and powdered sugar. Mix well using a wire whisk. Let the frosting cool a bit, so it can thicken up. If you're in a pinch for time here's a tip to quickly cool the frosting. In a large bowl at cold water (I add ice). Place the whole pot of frosting into the water. Using a wire whisk, quickly mix the frosting until it thickens. Remove pot from water and frost the brownies. Spoon 1 - tablespoon of warm frosting over each brownie and spread to the edges. Allow the brownies to cool completely before piping on decorator icing to resemble football laces. Cooks Note: A fudge brownie mix can be substituted for milk chocolate, and 2 containers of store bought chocolate frosting can be substituted for homemade frosting. You can also omit the frosting and just use the decorator frosting to make the football laces. Also don't toss out the brownie scraps. I stored them in a large zip lock bag, because they're wonderful warmed up in a bowl topped with vanilla ice cream. These look so tasty! Love your DIY football cutter..you're soo clever! Thanks for sharing this fun idea. Pinning!! Good think'n on the cookie cutter idea. Your cute brownies look Awesome. A few years back I had bought a football cookie cutter set at Michaels by Wilton which contained a pennant, football, jersey and helmet cookie cutters.